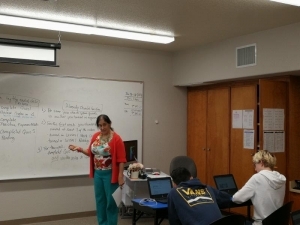 DU HỌC CÙNG ASTON - What are we doing in the SAT Prep class? What are we doing in the SAT Prep class? Well, every week we work on something in math and something in reading, using both lessons from the College Board and Khan Academy’s Official SAT practice Diagnostic Quizzes, personalized practice and videos. We also discuss how to understand the math or reading material tested on, and have in class requirements to take notes on what was discussed. 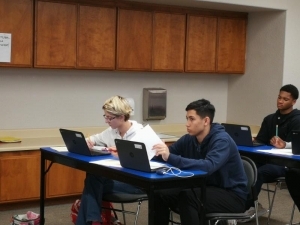 All students are expected to work by themselves on the SAT practice Quizzes and materials and work with others on the in class worksheets and discussions. Most of the students are taking Algebra 2 this semester along with this class, but because some of the SAT Questions in math are likely to be something that students have not yet masters, we discuss and then practice the types of math concepts that the SAT questions will contain and then students will take another Diagnostic test later in the semester to see what they have learned and how they have improved. They will also be able to see what they still need to learn before taking the SAT and scoring well.